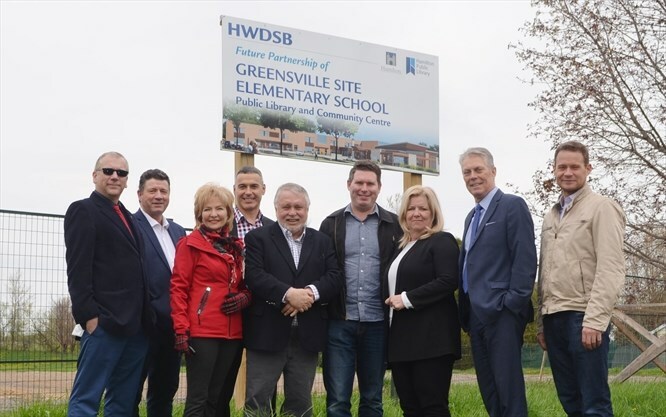 The new Greensville school and community hub project has cleared two provincial hurdles and will proceed to tender in early June, Hamilton-Wentworth District School Board chair Todd White announced May 11. White said project received approvals from the Ministry of the Environment and Climate Change for stormwater and septic systems, which delayed the building process. White noted the board was a bit surprised by the stormwater and septic delays because the site had previously been home to a school. “It took several more approvals than expected.” – HWDSB chair Todd WhiteThe $11.9 million project was originally approved in October 2015, with the province contributing $3.5 million. He said the project has received a preliminary site plan approval from the City of Hamilton, adding the board should have final site plan approval in the next couple of weeks. As a result, the board is expecting to have shovels in the ground later this summer, with the project slated to be completed and open to students in September 2019. “That’s doors open, bells ringing, flag raised, you name it,” he said. White noted it takes the board between 12-18 months to build an elementary school and at 347 pupil places, the Greensville project is slightly smaller. In addition to the 39,000-square foot school and 2,500 square-foot daycare centre, the community hub project will also include a Hamilton Public Library branch and a City of Hamilton community centre. The new building will be built behind the former school site, which will be the 71-space parking lot in the new design. The community centre component is a large space that is divisible, with a kitchen, washroom and multi-purpose rooms. White added then-Ancaster-Dundas-Flamborough-Westdale MPP Ted McMeekin’s office was critical in helping the board secure the approvals. It was critical to receive the approvals now, White said, because if the project was delayed further they would have lost anywhere from half a school year, to a full year. “You don’t move (students) in the middle of October, for instance,” he said. While the board has five projects going to tender shortly, White noted the Greensville project, as well as the new Beverly school, are long overdue. “They’re really great pieces,” he said. For his part, Hamilton Public Library chief librarian Paul Takala said he’s very excited that the project is moving forward. Meanwhile, Ward 14 councillor Robert Pasuta said it’s great to see the project moving closer to completion. Ward 13 and 14 trustee Greg Van Geffen said the school community is eagerly awaiting the project. “They’re eagerly awaiting, with great anticipation, the opening of the new school,” he said. He noted the board will hold a public information session to provide an update on the project May 24 at 6 p.m, at Spencer Valley Public School.